Auatralia Day - January; Country Music Awards & Festival – February; Boyup Ute & Truck Muster - February; Mayanup Camp Draft – March; Harvey Dickson Music Festival – September; Power Dinghy Race – September; Blackwood Marathon – October; Harvey Dickson’s Rodeo – October. Upper Blackwood Show – November. 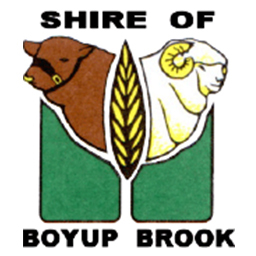 Boyup Brook Districts Pioneer Museum; Local Wineries; Sandakan Memorial; Gregory Tree; Blackwood River; Norlup House; Sandy Chambers – local artist; Harvey Dickson’s Country Music Centre; Perup Ecology Centre; Roo Gully Wildlife Sanctuary; Tulips with a Difference. Vineyards; timber plantations; general farming; sheep, cattle; grain; trees; pigs; various cottage industries; olives.